Introduction: It appears that everyone is stepping it up this coming year with newer, more stylish, and better performing baitcasters. 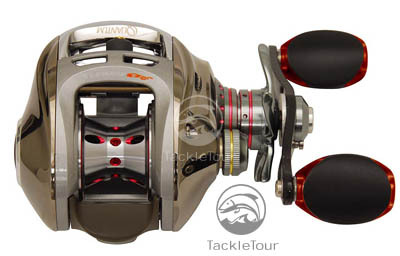 Quantum brings out the big guns by revamping their top of the line reels making them lighter and giving them a more stunning appearance by paying closer attention to fine details. Here's a peak at what we can expect to see on store shelves in the late Fall. the enthusiast styled handle made of lightweight carbon fiber with flashy knobs that aren't just created from ergonomic rubber, but include some red, outer detailing. The new handle is a very nice enhancement to the Tour Edition PT and Quantum is the first US manufacturer to offer a stock reel with a carbon fiber handle. Many anglers complained about the weight of the previous generation Quantum reels and it looks like they have listened and addressed this issue with their new reels. The Quantum reels used to weigh on average, around nine plus ounces but now the Tour Edition PT weights only 7 ounces and sports 11 bearings! That's a huge weight decrease and something we all applaud. Here's some more details about the reel itself. 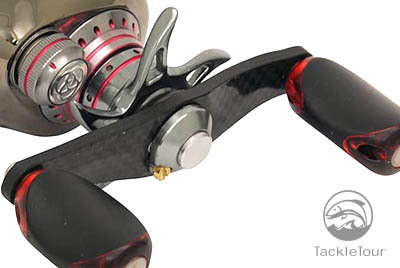 The baitcast reel has a machined aluminum frame, sidecovers and front support, 11 PT bearings, lightweight aluminum main gear, Titanium vacuum deposition coating, Micro ACS cast control system, and a ceramic drag system. Quantum is introducing the Tour Edition PT in both left and right models along with two different gear ratios. The Burner model has a speed of 7.0:1 and a shallow spool design. 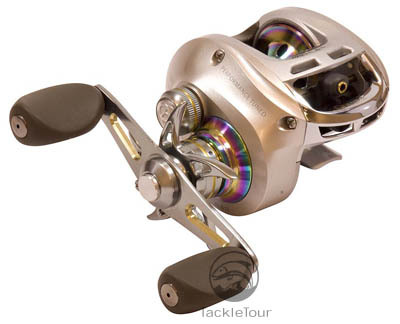 The slower 6.3:1 gear ratio reel has a deeper spool which will hold more line for those applications that demand it. Energy PT: Next on the list is the Energy PT which has the same profile as the Tour Edition PT with some differences. Instead of 11 PT bearings the Energy PT has only 9 PT bearings. The frame, side covers, and front support is also machined from lightweight durable aluminum but does not get the premium Titanium vacuum deposition coating. Instead it uses a coating layer process to finish the reel. Again, the Quantum Energy PT makes use of the Micro ACS cast control system and ceramic drag system. 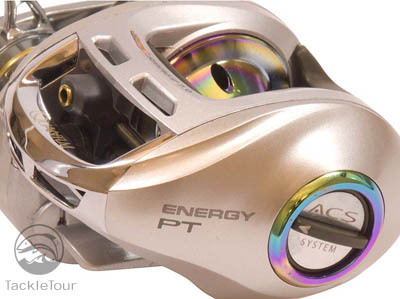 The Energy PT comes in five different models, where the 7.0:1 and 6.3:1 ratio reels also come in left hand retrieve. The E100PPT is the cranking reel with a slow powerful speed of 5.1:1, great for running deep running crankbaits. Catalyst PT: It looks like the Accurist PT will not be back for 2009 but Quantum has something to fill this void. The Catalyst PT is a new addition to Quantum's baitcast series and looks like it's even better than the Accurist PT series. 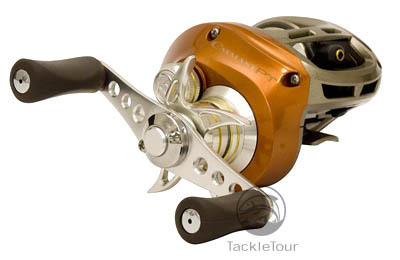 The reel has attractive orange side plates and other detailed highlights throughout. The Catalyst PT also has the same profile of the other two reels mentioned above but it only has a machined aluminum frame and side cover, 7 PT bearings, Micro ACS cast control, and ceramic drag system. 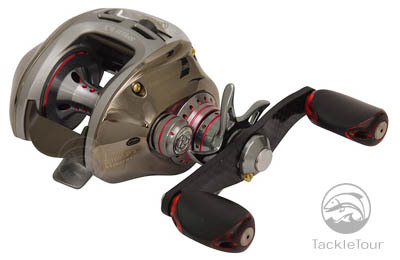 The Catalyst PT reels are offered in both left and right hand retrieve and comes in Burner 7.0:1 and 6.3:1 gear ratios. Conclusion: The baitcaster brawl continues! This coming season is going to be a very competitive one with every reel manufacturer putting out much more refined and stylish reels. 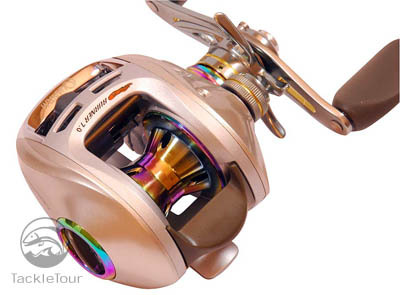 The Quantum high-end baitcast reels get a stunning redesign with a new low profile construction. The details on the reels look great so far especially what we see on the Tour Edition PT. 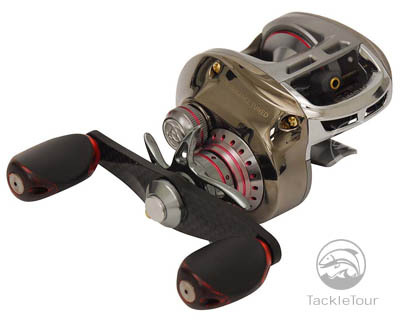 Quantum is the first US manufacturer to release a stock reel with a carbon fiber handle, something many enthusiast anglers do as an upgrade with their reels. 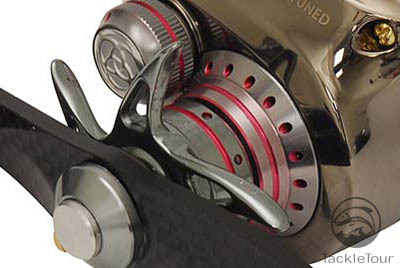 Another big plus that we see with these new reels is a good weight reduction. The Tour Edition PT is now only seven ounces while the Energy PT and Catalyst PT weighs 7.8 ounces. Quantum will release other new products at the upcoming ICAST show, but is off to a great start with contenders like the Tour Edition PT which makes use of enthusiast materials and styling..... let's get ready to rumble!